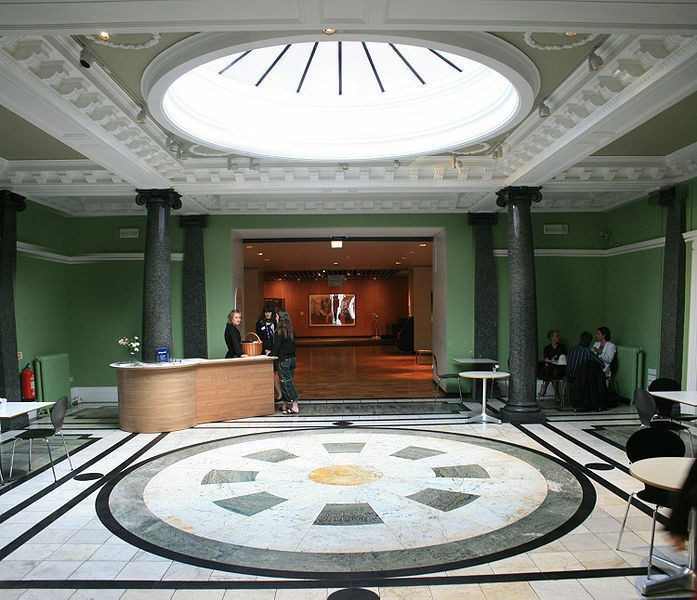 An art gallery and performance space, surrounded by a park, is a walk or bus ride away from Manchester city centre. The Whitworth can be found at the top end of Oxford Road, past the university departments, hospital, Manchester Museum and the now demolished BBC building. John Piper's The Mountains of Wales exhibition is on show on the upper floor. The paintings depict nature at its most raw. Scenes, such as The Snowdon Range are rendered in dark shades, with dapples of white. In other paintings, the influence of J.M.W. Turner is evident. Rocky Valley, North Wales portrays a sunrise in a riot of colour. These works deserve to be lingered over, to absorb their detail and rugged splendour. A watercolour by Turner (Llyn Cwellyn, Caernarvonshire) is in the adjoining gallery. 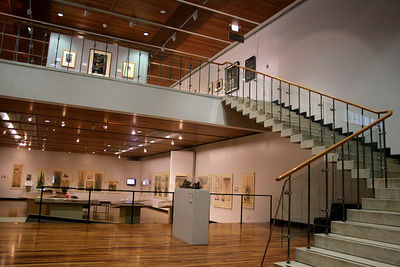 The exhibition Watercolours of the Welsh Landscape compliments the Piper exhibition. As well as landscapes it includes more narrative works such as The Welsh Funeral, Betws-y-Coed (c. 1848) by David Cox. In the other adjoining gallery, contemporary artist Richard Long creates sculptures from quarried stone. The gallery is displaying White Onyx Line and Tideless Stones, which were inspired by walks he has made in Dartmoor and the Cairngorm Mountains. For me, they did not have the instant appeal of Piper's work but the gallery guide I spoke to made a strong case for their imaginative power. Downstairs, another contemporary artist takes us into the world of the family home. Michael Landy's video Four Walls is about his Father, John Landy, a miner, who was housebound after being seriously injured. The video features scenes from home improvement manuals and magazines, collected by John. In the context of his story, the 'slide show' has a kind of poignant innocence in its scenes of idealised family life. The South Gallery hosts exhibitions, activities for children and performances. When I visited, students from the nearby Royal Northern College of Music (RNCM) were playing a Sound of Music medley. The area was soon over-run by children taking part in a Colourful Sundays creative workshop. On the walls are paintings by David Hockney and his Royal College of Art (RCA) contemporaries. The exhibition-notes tell us that the RCA establishment was shocked by the influences of American abstract expressionism and the emerging pop culture. Hockney's We Two Boys Together Clinging was inspired both by American poet Walt Whitman and Hockney's admiration of the young Cliff Richard. The Whitworth staged Hockney's first British show in 1969. It was founded in 1889 and came under the stewardship of Manchester University in 1958. Dr Maria Balshaw, the current Director, explains that: "The Whitworth was created to inspire the region's textile industry, give pleasure to Manchester citizens and to instruct students and artists about the visual arts." The textiles, displayed behind glass cases, include fifth and sixth century linen and wool tapestry from Egypt. There are also silk scarves and other work by twentieth century artists like Ben Nicholson, Barbara Hepworth and Paul Nash and dyed-textiles by contemporary Japanese artists. Two of the most eye-catching creations are a dress, made by Errol Pires, using the ply-split braiding method – inspired by nomads from North West India. I also admired the life-like crows, created by Ruby Chishti, from cotton and hay. 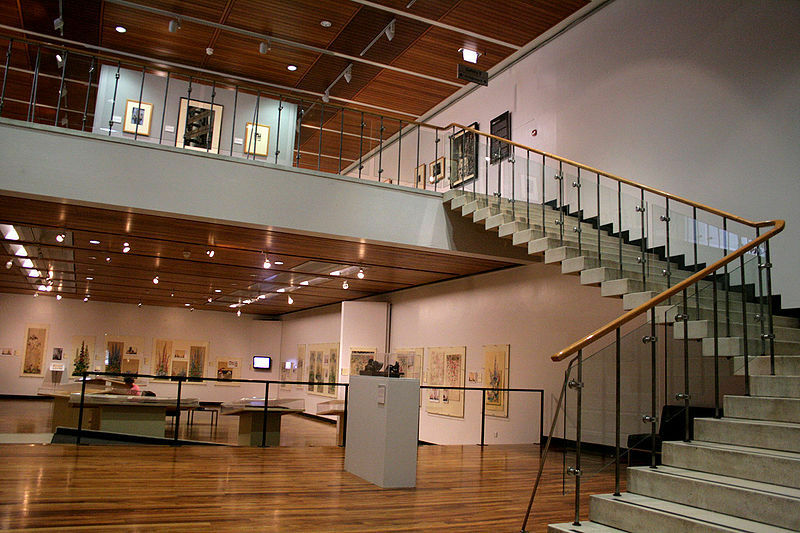 The Whitworth has ambitious plans for the future. It wants to develop the connection between the building and green space outside with a new entrance. It also intends to commission artists to develop a play and relaxation space. In the café you can enjoy everything from beans on toast, to roasted pumpkin or lobscouse. It hosts art and craft workshops on Wednesdays. There is also a children's menu. 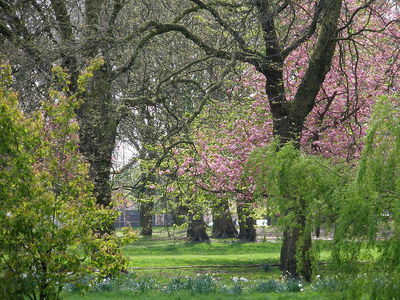 Alternatively, you could have a picnic amongst the trees in the park. 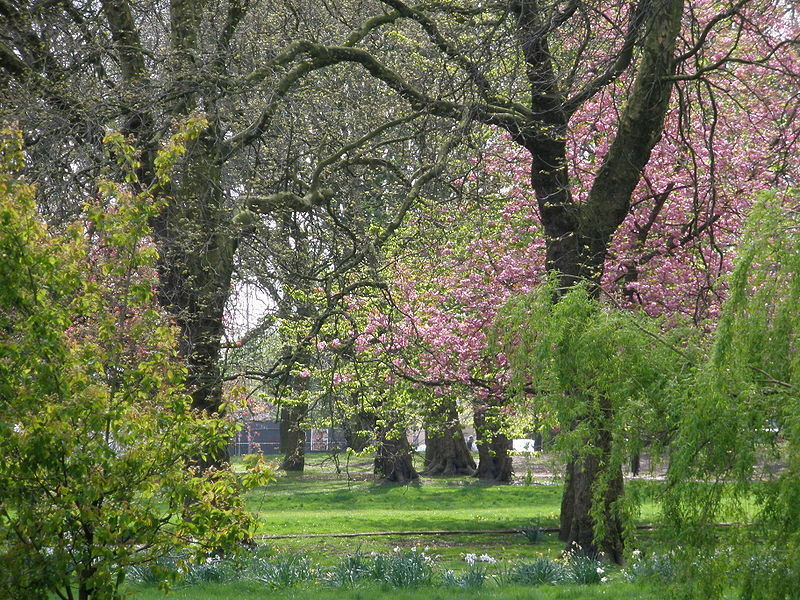 Whitworth Park trees in blossom. Why? A gallery in the city with picnic-space outside.